New updates to Honda's robot Asimo allow it to now move without the assistance of a human operator, travel over uneven surfaces, and better recognize voices and faces. Now Asimo not only can find us no matter where we hide and hunt us down over even the roughest of terrain, but it also can't be turned off. Thanks Honda! 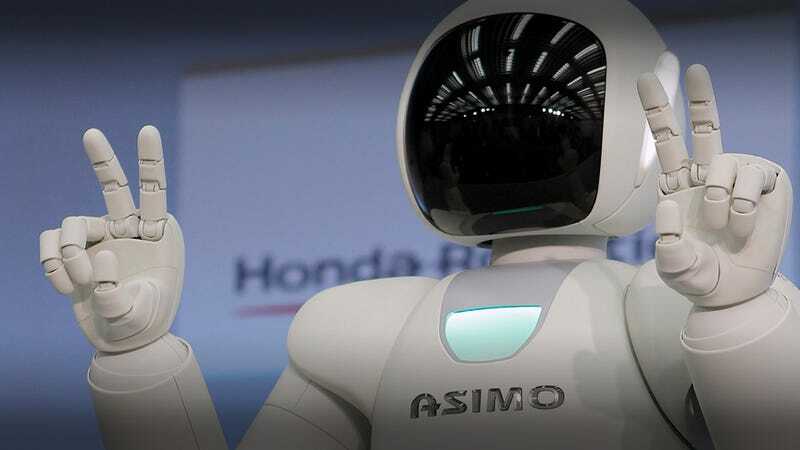 Dystopian sci-fi future or no, the updates to Asimo make it an altogether more capable robot, with new "advanced intelligence capability," fingered hands, and strengthened legs. All this means is that Asimo can now better interpret its surroundings and predict people's movements. Moreover, it can now interact more with the world, with fingers that can hold things gently and even perform sign language. Communication, strength, autonomous operation? Pass the soylent green, please.